Do you love Tower Defense games? Color Stone LTD has created Tower Defense EVO, a full featured TD game for the iPhone with tons of exciting lotions, machinery, weaponry, and upgrades. Originally for sale in the Microsoft Marketplace, the Tower Defense EVO game has made its way into the App Store. You get to three maps and three styles play. The battlefield areas are exciting since they are for the most part open and witout any specific routes that your enemies have to follow. Use your guns, rocket launchers, bombs and other weapons to build your own routes for the enemies to follow. As with any other tower defense game, you gain more money by killing enemies which you can use to buy or upgrade to better weapons. Waves or as referred to here by rounds in each battleground and the enemies keep getting stronger, faster, and more resilient requiring you to be constantly improving your plan of attack. The game’s objective is to rack up points and finish survive all 100 rounds in each battleground. Each map gives you 20 lives (or enemies) that you can let into your tower before you lose. Drag weapons from the bottom to battlefield and drop wherever you see a green hexagon surrounding your weapons indicating available real estate while a red red hexagon indicates an area where you cannot place any weapons. Tap on any existing weapon to upgrade or sell. You can zoom in and out by using two fingers to pinch and pull for a closer view. There are total of six weapon types each of which can be upgraded 2 times. Enemies include commerce RVs, airplanes, soldiers on foot and more. If you get bored or have little time you can speed up the game using the fast forward button. You can click to the main screen at any time or just pause the game if you need a break. Your top casualties, ( high scores ) are saved in the game as a list that you can view at any time, although Tower defense EVO doesn’t have support for online scoreboards. The music in the game gives it a very thrilling and almost war movie like feel and much like the game itself, the music doesn’t get boring. In fact the simplicity and open-ended gameplay of our defense he veto makes it extremely addictive in just a few minutes. One sorely missing feature of TD EVO is saving games when you quit, which is a huge downer. Imagine playing 98 rounds, running out of battery and having to start all over. Secondly it would help improve the game if there was an explanation of the various weapons maps and enemies. Finally online scoreboards would be great to have. Overall power defends EPO is recommended for its high replay value, great graphics, and simple yet exciting gameplay. Once you get this game you you want to delete it from your iPhone. We hope to see more battlegrounds added in the future. 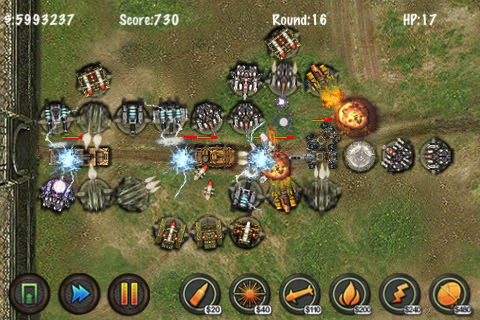 AppSafari review of Tower Defense EVO was written by Joe Seifi on March 4th, 2010 and categorized under App Store, Featured, Fun, Games. Page viewed 5687 times, 1 so far today. Need help on using these apps? Please read the Help Page.